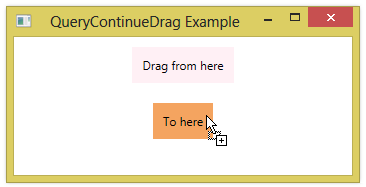 The QueryContinueDrag event lets you know when a mouse button changes during a drag-drop operation. It will also indicate whether the state of the Shift, Ctrl, or Alt keys change while dragging. You wire up an event handler to the control that the drag-drop operation originates from. In the example below, the source control waits for the left mouse button to be released and then cleans out its content. 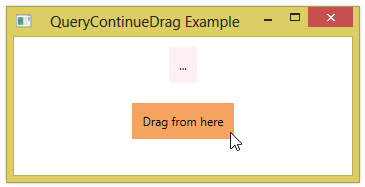 <Label Content="Drag from here" Background="LavenderBlush"
<Label Content="To here" Background="SandyBrown" AllowDrop="True"
If you are handling the DragOver event during a drag-and-drop operation and you want to find the current mouse position, you need to use DragEventArgs.GetPosition, rather than the static Mouse.GetPosition method. In the example below, we initiate a drag-and-drop operation in a window and then try reporting the mouse’s position in the window’s DragOver handler. We try using both methods to get the mouse position, but only the DragEventArgs.GetPosition method works. You can implement drag-and-drop on a touch-based system in a similar way to how you implement drag-and-drop using the mouse. You start by defining a handler for the TouchDown event of the control that serves as a drag source. You then define a handler for the Drop event of the control that is the drop target. In the code-behind, you call the DoDragDrop method to initiate drag-and-drop. You can now touch and hold your finger down to drag. You can use the GiveFeedback to change the cursor during a drag-and-drop operation. You can set the cursor to be some text by rendering a visual element to a bitmap and then converting that bitmap to a cursor. Here’s a helper class containing a method that converts some text to a cursor. // The Visual to use as the source of the RenderTargetBitmap. // The BitmapSource that is rendered with a Visual. We can test this code by setting the cursor to some text when we drag a Label. <Label Content="Drag to here" Background="SpringGreen"
Here’s the code for the drag-and-drop operation. You can use the GiveFeedback to change the cursor during a drag-and-drop operation. You can go a bit further and set the cursor to an image that represents the user interface element that you are dragging by rendering the UIElement to a bitmap and then converting that bitmap to a cursor. Now that we have the helper class, we can use it to set the cursor to the image of a Label that we are dragging. Here’s the XAML defining a label to drag from and one to drag to. <Label Content="Data to drag" Background="AliceBlue" Padding="15,10"
<Label Content="Drag to here" Background="MediumSpringGreen" Padding="15,10" Margin="20"
You can use a non-default cursor while a drag-and-drop operation is in process by handling the GiveFeedback event. In the example below, we load a custom cursor from a .cur file located in the same directory as the executing application. You can change the mouse cursor during a drag-and-drop operation by handling the GiveFeedback event for the drag source. 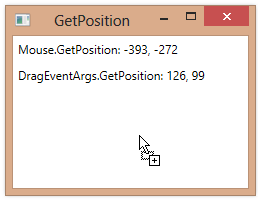 The GiveFeedbackEventArgs.Effects property will indicate the current effect, depending on the mouse position. You can set the mouse cursor based on the effect. In the example below, we change the mouse to a “hand” whenever the effect is Copy, indicating that we’re allowed to drop the data. <Label Content="Data to drag" Background="AliceBlue" Padding="15,10" Margin="10"
<Label Content="Drag to here" Background="MediumSpringGreen" Padding="15,10" Margin="10"